NEW YORK – Hello Giants fans, the NFL free agency madness begins tomorrow. I fully expect GM Jerry Reese to have a plan in place, that will be put into motion when the clock strikes. His plan is already in motion, we are in motion right now, can you feel it? Areas that could be effected include the offensive line and the running backs. OL Kareem McKenzie might meet his replacement if reports are correct. RB Ahmad Bradshaw, RB DJ Ware and RB Da’Rel Scott should all be on the final roster. Who the fourth running back will be is a mystery. Expect Reese to dig out a solid RB from the draft in the mid-rounds. This could also be addressed via free agency where Big Blue could make a run for tier-two talent. Making a play for a solid tight end is not out of the question either. The offense would benefit from an experienced veteran at the position. An offensive lineman with experience would make sense as well. Some should check in on OL Shawn Andrews and see what he has been doing. The return of OT William Beatty will be a plus as well. That about covers the offensive options in my opinion, on the defensive side of the ball, I see linebacker as the primary area of interest. If the Giants were to lock up DE Osi Umenyiora for 3 years and then spend a little on a solid linebacker via free agency, they may have something there. Of course, you have to include locking down LB Chase Blackburn for 3 years as well. Both of those guys are very important to what happens on the field on defense and special teams. It’s a smart move that makes sense, plus both guys want to retire as Giants one day and possibly make it into the Ring of Honor. You can go to bed at night knowing both of these guys will be worth what they are paid three years from now. DE Justin Tuck, DE Osi Umenyiora and DE Jason Pierre-Paul together for the next three years means at least one more Super Bowl ring for the Giants Dynasty Team. Another ring means all of the NFL “experts” and haters are silenced for a decade. And you know what? Eli is going to do it. Expect Big Blue to strike like lightning and make a bold move early in the free agency period. When you have the last pick in the draft, 32nd overall, it makes sense to strike quickly in free agency to bolster your squad. At least it makes sense in my mind and justifies an aggressive approach from the onset. I am just as curious as the next guy about which direction they will take regarding talent and managing cap space. Bravo again to captain QB Eli Manning for restructuring his contract to free up over $6.5 million in cap space. What a team player and superb leader he is for this franchise and he has now become the Greatest Quarterback in New York Giants history in my opinion. Put it in the record books ladies and gentlemen. Speaking of quarterbacks, will the G-Men be looking into other backup quarterback options for Iron Man Easy Eli? Some reports say QB David Carr might be on his way out. I’ve always liked Carr and though he brought some stability to the backup QB position. We will find out soon. Who are some of the free agent players you have your eyes on for the New York Giants? NEW YORK – I feel very strongly about this. The next class to be inducted into the New York Giants Ring of Honor should include former GM Ernie Accorsi in my opinion. Along with Accorsi, guys like RB Rodney Hampton, LB Pepper Johnson, DT Keith Hamilton, P Jeff Feagles and DE Leonard Marshall should be considered as well. They all deserve to be a part of New York lure forever. Coming off a Super Bowl winning season, it would be cool to have them all with Super Bowl rings of their own. I haven’t heard anything announced about the upcoming class but it certainly should be interesting. To be honest, at times I get a history lesson when an old timer is inducted and I have to do my research on them. It makes it more fun if you ask me. There are a few other guys like QB Eli Manning, RB Ahmad Bradshaw, RB Brandon Jacobs, DE Justin Tuck, DE Osi Umenyiora, OL Rich Seubert, OL Chris Snee, John Mara, Steve Tisch, Pat Hanlon and C Shaun O’Hara who will be up in lights one day too. But people forget about Ernie Accorsi and the long term contributions he has made for the team, even beyond his retirement that continue to pay off for Big Blue. It is time for this man to be honored the proper way, even if he doesn’t want it. I hope that the majority of Giants fans already know what I mean and agree with me. For the Giants fans that have “heard of him” but don’t know about him, you really need to read about this man. He is a legend in New York football. I was one of the fans who were concerned when Mr. Accorsi handed over the team to current GM Jerry Reese. Not because I was worried about Reese but because I was so comfortable with Accorsi. Jerry Reese certainly can be considered one of those contributions to the team that continues to pay off. Accorsi gave Reese his full blessing with the brass at Big Blue, which made for a smooth transition for young buck Reese. And make no mistake about it, Jerry Reese has since made a name for himself and flourished with managing premium talent. He is particularly surgical with the NFL draft and just like his predecessor, has won me over. I trust his choices and know that he is trying to field the best possible team at all times. Yes, Giants GM Jerry Reese will certainly be added to the Ring of Honor one day but maybe not before, Head Coach Tom Coughlin. Right now, we have the 2012 NFL Draft, 2012 Giants Minicamp, OTA’s, Schedule releases and analysis and a bunch of other interesting Giants news coming up. Be sure to come back and check it out! Do you think Ernie Accorsi deserves to be inducted into the New York Giants Ring of Honor? NEW YORK – Hello Giants fans, it’s been a couple of weeks since we last spoke. I took a nice, long break from writing. The last time we spoke it was Valentines Day and the time before that we were still talking about the Giants beating the Patriots 21-17 in Super Bowl XLVI. The Giants players and staff gave fans the VIP ‘blue carpet’ treatment at the DVD release party yesterday. Thanks to Marc and Max over at Vivendi Entertainment and NFL Films for the invitation. I would also like to thank Brittany over at Taylor for the info on Giants legend Sam Huff. 5-Time Pro Bowler LB Robert Lee “Sam” Huff is being honored by the Pro Football Hall of Fame and AllState Insurance in Farmington, West Virginia on Monday March 12, 2012 at 5:30 PM at the Farmington Community Center. Check it out if you can make it to the Hall of Famers hometown for the festivities. I can’t believe it has been two years already working with my own website. Of course, I have been writing all of my life in one form or another. I would like to thank our readers and let you know that I have officially signed on for another year to cover the Giants with this website. I will continue to keep this a family friendly environment and readers should fell free to leave comments on any of our stories, the more the merrier. The Giants are now 2-time Super Bowl Champions over the past five years, that still feels incredible to say and the haters have been out in full force with Cowboys fans going back to the 1990’s Dallas teams and comparing them. Philly fans are still in shock and awe about the atrocious display of football skills the Eagles broadcast LIVE worldwide to millions of NFL fans. Eagles fans just straight up hate, they pull no punches but can get annoying after a while. I haven’t heard a Redskin fan talk any trash since the 1980’s (Yes, I’m getting old, don’t worry about it). The G-Men and Easy Eli are elite. Things have really been going well and I look forward to providing our readers with some in depth New York Giants draft coverage from my perspective. On a side note, I like the WR Domenik Hixon signing and I think our special teams just got a lot better. Slapping the franchise tag on Weatherford was music to my ears and all of the players on “Team I Got a Ring” too. Giants GM Jerry Reese gets big props for this bold move and extremely loud and incredibly close statement to the other players in regards to contract negotiations. That is a display of loyalty to the mad man punter Steve Weatherford as well. Hey, what can I say, the guy has become a fan favorite and we follow him on twitter (Follow back man @nygreporter). The dude is jacked and plays like a football player. I hope WR Mario Manningham (What’s up Super Mario?) can resign with the team. The fans love this young man and he is just starting to get a feel for the offense. The last place I would subtract from is familiar weapons for QB Eli Manning. I love the “Nicks Cruz Travel Agency: Destination Endzone” duo out there but they still need one more piece to the puzzle. I believe Manningham is that guy. I will be doing an article this week on player positions to look at in the upcoming draft in April. Until then, the New York Giants remain Super Bowl XLVI Champions, that is all. 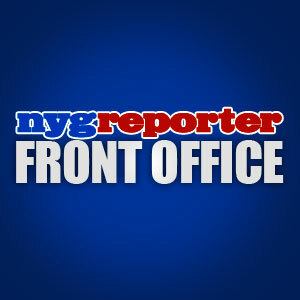 Do you have any favorite moments from the past year at nygreporter? It’s a loaded question. 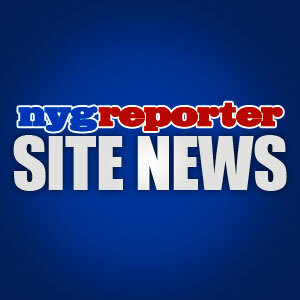 RD – nygreporter.com – Happy 2 Year Anniversary! NEW YORK – That was one heck of a way to end a great season. The Giants defeat the New England Patriots 21-17 in Indianapolis. It took a fourth quarter comeback to win a second Super Bowl for Big Blue as QB Eli Manning wins his second Super Bowl MVP Award. Most seem to agree this win puts Tom Coughlin and Eli Manning in the Pro Football Hall of Fame, you can include myself among them. There really is no way to describe the joy I’m feeling now and will feel for a very long time. I’m stuck someplace between numb and bursting with energy. Some where in between shocked and exhausted. I’m running on empty but so happy that it doesn’t matter at this point. The true blue fans have been waiting and anticipating this moment and when it finally arrives, it’s wonderful. So enjoy it! Thank you to the New York Giants organization including the Mara and Tisch families. Thank you to Head Coach Tom Coughlin, the rest of the coaches and players. Thank you GM Jerry Reese, who has done an outstanding job, since taking over for Giants legend Ernie Accorsi. Go back and read all of my articles about Mr. Reese and you will see I have always been a fan of his work and have praised his draft skills and player transactions. Some of his moves however, had even me scratching my head this past offseason. In the NFL Lockout riddled 2011 year, players were coming and going at will in the NFL and the G-men lost some key players like WR Steve Smith, TE Kevin Boss, C Shaun O’Hara and OL Rich Seubert to retirement or contract situations. Then they lost CB Terrell Thomas, LB Clint Sintim, OT William Beatty, WR Domenik Hixon, LB Jonathan Goff and about ten more guys to the dreaded IR list (injured reserve). 2011 marks three straight years of injury epidemics for the G-men with at least 12 going on the season ending IR list, per year, that’s about 20% of the team going down for three straight years. But the Giants and Jerry Reese made all the right moves that had this team clicking by the end of the season. Congrats you are now Super Bowl Champions! I thought singers Kelly Clarkson and Madonna did a good job with their respective areas of the nights entertainment. I thought NBC could have done a better job with the trophy presentation and post game stuff but thats why we have remote controls right? I also noticed audio problems coming from the NBC channel during the game. I suggest that Giants fans out there savor this moment and really enjoy this win for a couple of days. Do not get into any talks about the draft or who is signing what contract and when, just relax for a few days and enjoy winning the Super Bowl. QB Eli Manning – Super Bowl XLVI MVP Manning had a great game finishing with 296 yards 1 TD and 0 INT’s. Congrats Champ! WR Hakeem Nicks – Nicks had a solid Super Bowl performance finishing with 103 yards 0 TD’s. Congrats Champ! RB Ahmad Bradshaw – Bradshaw played like he wanted another ring and finished with 72 yards 1 TD rushing and 19 yards receiving. AB is a big part of this Championship. Congrats Champ! DE Justin Tuck – Tuck was emotionally spent following his 2 sack performance in Super Bowl XLVI. God Bless and Congrats Champ! LB Chase Blackburn – Blackburn was making a lot of plays out there and finished with 1 INT. Congrats Champ! DE Jason Pierre-Paul – JPP will forever be double teamed now, so he will need to get bigger. He was still causing havoc and blocking passes. Congrats Champ! TE Jake Ballard – Jake Ballard was injured during the game and finished with 10 yards. Congrats Champ! CB Corey Webster – Webster played like a Champion and got his ring, great season Corey! Congrats Champ! RB Brandon Jacobs – Jacobs ran hard and finished with 37 yards. Two rings for Mr. Jacobs now. Congrats Champ! S Antrel Rolle – Rolle was playing his heart out and creating chaos for the Patriots. Congrats Champ! WR Victor Cruz – The Salsa King Cruz caught Eli Manning’s only TD pass of the game. Congrats Champ! CB Aaron Ross – Ross owned the first quarter and really made an impact in this game. Congrats Champ! LB Michael Boley – Boley had an outstanding game and was the leading tackler for Big Blue. Congrats Champ! WR Mario Manningham – Super Mario had the play of the game and finished with 73 yards 0 TD’s. Congrats Champ! S Deon Grant – The veteran safety was fourth on the team in tackles and really whacking guys out there. 3 more years! Congrats Champ! TE Bear Pascoe – Pascoe filled in nicely for the other two injured TE’s and finished with 33 yards. Congrats Champ! DE Osi Umenyiora – Osi was causing disruptions for most of the game and really turned up the heat at the end. Pay Osi! Congrats Champ! FB Henry Hynoski – Hynoski made a couple of nice catches and was blocking like a mad man. Congrats Champ! TE Travis Beckum – Beckum tore his ACL early in the game and never returned. I’m sure the Super Bowl ring will help him heal. Congrats Champ! DT Linval Joseph – Joseph did a great job in the middle and is a player to keep an eye on. Congrats Champ! S Kenny Phillips – KP was second on the team in tackles and was throwing his body into every tackle. Congrats Champ! DT Chris Canty – Canty had a nice game was clogging up the middle for Big Blue. Congrats Champ! 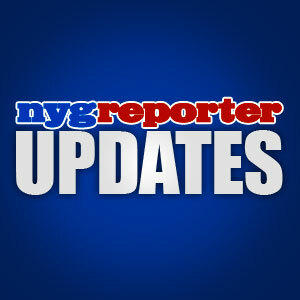 P Steve Weatherford – The Giants will sign Weatherford long term this offseason. The Weatherman had an outstanding game. Congrats Champ! K Lawrence Tynes – Tynes had a great game by making both of his FG attempts and his lone extra point attempt. Congrats Champ! Giants Offense – The Giants offense beat the Patriots defense for most of the game. Now, they are Champions of the World. Congrats Champs! Giants Defense – The Giants defense held Brady to 17 points. They had 2 sacks and 1 INT. Great Game Champs! Giants Special Teams – The special teams had a very nice game and have improved a lot since week one. Great Game Champs! 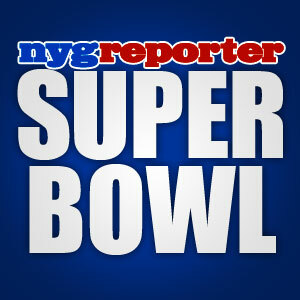 What did you think about the game and Super Bowl XLVI festivities? RD – nygreporter.com – I’m a bELIever! NEW YORK – Hello Giants fans, I certainly hope you are all getting into the holiday spirit this season. I have a special guest for you today, Giants RB Rodney Hampton will be giving the trivia question today as well as his personal tips for those interested in playing football. 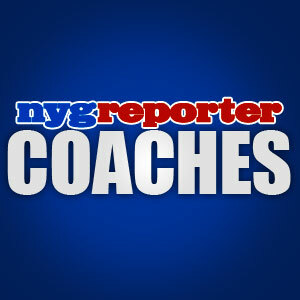 Rodney Hampton was nice enough to grant us an interview earlier this year NYG Reporter – Rodney Hampton Interview – April 2, 2011 and I have stayed in contact with him and help him promote Hamps Camp Rodney’s football camp and after school programs for kids. I appreciate him taking some of his time out to add to our advent calendar here. Welcome back Rodney! Welcome to DAC Day 2! If you’re a fan of RB Rodney Hampton, then this is your lucky day. This article is filled with cool Hampton stuff from the man himself! I hope our readers enjoy this and I have a feeling we might be hearing from Rodney again this month. Perhaps he will answer one of your questions when he returns. I encourage our readers to leave a question in the comment area for Rodney and I will see if he can answer one for the readers in his next article with us. Rodney’s Tip: Safety first kids! Make sure you have the right equipment and that it fits properly. Always have your parents involved and have fun. Question: There is one question that we all get asked at least once in our life. That question is, what is your favorite holiday? Mine, hands down is Christmas. I love Christmas for the lights, family, friends, gifts, food, music and all of that good stuff I remember from my childhood. Rodney, what was Christmas like at the Hampton house when you were a kid? What is your favorite all-time holiday memory? Rodney’s Answer: It was great. I remember waking up in the morning and feeling the excitement before opening gifts. Priceless! I spent many of my childhood holidays at my Grandmother’s house in Natichitoches, Louisiana (near Shreveport, Louisiana). Every year on Christmas eve, my Mom and Dad would pack up all 5 of us kids and drive 3 1/2 hours to Louisiana. All of my Aunts, Uncles and Cousins would be there and we’d have such a fun time! As for your second question, my favorite all-time Christmas memory was when I was 5 or 6 years old and I got a Big Wheel! I remember not even wanting to open any of my other gifts when I saw it under the tree. It had a storage box on the back and a break on the side. I had so much fun on that thing riding fast and burning rubber! 1. Hampton is a Super Bowl Champion? 2. Hampton is a Pro Bowl Player? 3. Hampton played his entire career with the New York Giants? 4. Hampton was drafted by the New York Giants? 5. Hampton was a first round pick? FACT, 1st Round pick, 24th overall. 6. Hampton wore jersey No.37? 7. Hampton is originally from Texas? FACT, he was born in Houston. 8. Hampton was once asked to co-pilot the space shuttle by NASA? FICTION, he was asked to be the MAIN pilot. Just kidding. 9. Hampton went to college at University of Georgia? 10. Hampton is the Giants No.2 all-time leader in rushing yards? FACT, Hampton is ranked second all time behind RB Tiki Barber. Bonus Question: Did All American QB Andrew Luck, of Stanford, attend one of Hamps Camps? Rodney’s Question: What number did I wear when I played football at the University of Georgia? Thanks for stopping by Rodney and we will see you soon! RD – nygreporter – Happy Holidays! – If any New York Giants players, current or former, are interested in adding themselves to this Christmas party, have your agent email us at nygreporter@yahoo.com. Please ask them to use a relevant statement in the subject field and we will confirm with your player via twitter, if possible, to a verified account. 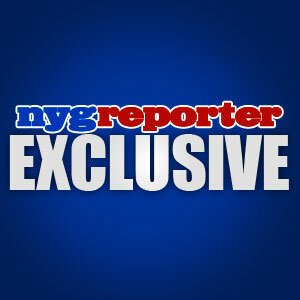 Please remember to follow us there @nygreporter, so we can confirm info privately. We are always interested in doing interviews with any Giants players willing to answer a handful of questions. Agents can find out the specifics by emailing us. As always, we remain a family friendly website. Happy Holidays! Please visit www.hampscamp.com and donate/contribute to Rodney Hampton’s camp for the kids! You are currently browsing the archives for the NYG Hall Of Fame category.